Are you a Newark High School Teacher or know of any who are? 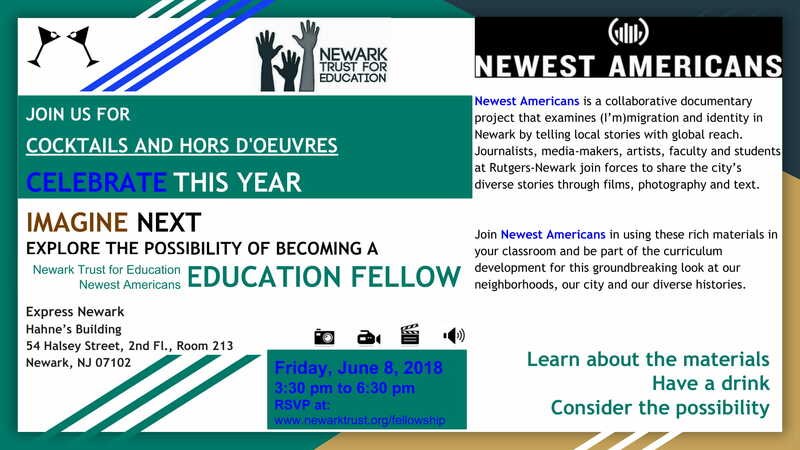 In partnership with Newark Trust for Education, Newest Americans is hosting Newark high school teachers for hors-d'oeuvres and drinks at Express Newark this Friday, June 8th from 3:30 to 6:30 pm to introduce our teaching fellows program and recruit teachers to join us in developing curriculum in September. Please spread the word about this PAID fellowship opportunity to any Newark High School teachers you may know. Please register by clicking on the link below or email info@newestamericans.com to attend by Wednesday, June 6th.